Below is an invitation to contribute to a study on strengths and limitations of human-based research in terms of broader applicability that should take only a few minutes. Please contribute if you can. Many fundamental concepts in evolutionary biology and behavioral ecology were discovered using non-human systems. Some or many of these concept are also applicable to humans. Here, we have become interested in whether this process can also go the other way around: to which degree can data from humans be relevant to understanding biological fundamentals in these fields? This question has become the core theme of a Proceedings B special issue later this year edited by Erik Postma and Sarah Brosnan. One unknown in this theme is the overall opinion of researchers in biology related fields. For example, to what degree do researchers believe that human studies can be relevant to discover evolutionary fundamentals? Do researchers believe that humans are subject to natural and/or sexual selection? To quantify the opinion of researchers in biology related fields on these and other issues, we have developed a survey. We particularly hope to identify common perceived strengths and limitations of human-based research in terms of broader applicability. The survey is short and simple and should only take a couple of minutes to complete. The collected data will be published in the Proceedings B special issue. Data remain completely confidential. We hope we can motivate you to participate to the survey. Your opinion and the reasons why are important. We believe this issue is relevant not only to researchers, but also to research councils, funding agencies and, more generally, the public opinion. 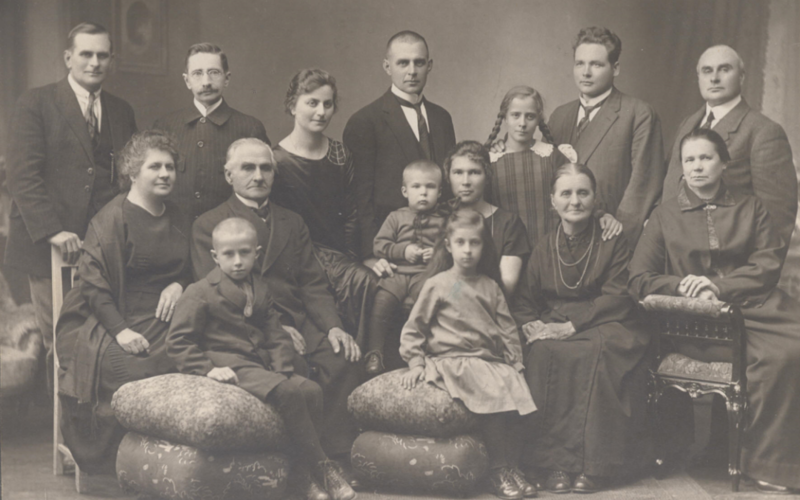 Image: Through the lens: three-generations of reproduction in historical Finns. What can we learn from studying human populations? Do grandmothers improve grand offspring survival? Does family size affect reproductive success and trait inheritance? Are contemporary humans evolving? 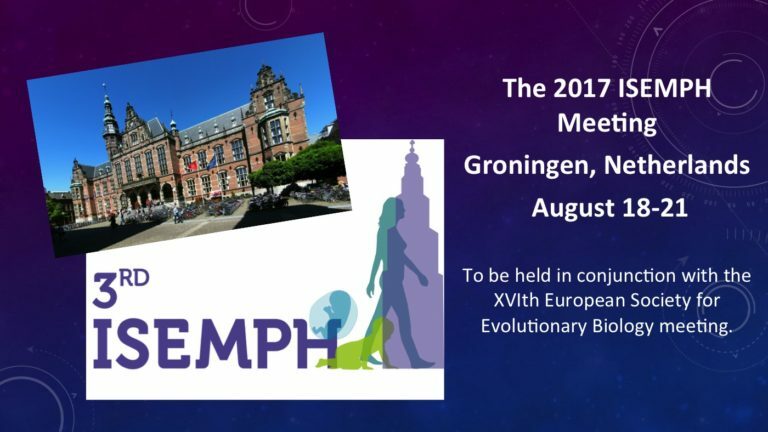 The landmark 2017 ISEMPH 3rd annual meeting will be in Groningen, The Netherlands, on August 18-21, 2017, in conjunction with the European Society for Evolutionary Biology (ESEB). February 15 is the deadline for submitting abstracts and the opening date for early bird discounted registration, so click here for full meeting information and click this link to submit your abstract today. Keynote speakers include Mervyn Singer (UK), Sylvia Cremer (Austria), Francisco Úbeda (UK), Peer Bork (Germany) and Jonathan Wells (UK), and for the overlapping part of the two meetings, Svante Pääbo (Germany), Linda Partridge (UK) and Stephen Stearns (USA). In addition to these stellar talks, paper sessions and poster sessions, the program committee, led by Frank Rühli and Nicole Bender, is planning diverse activities including workshops, round tables and social events to foster networking with international colleagues. 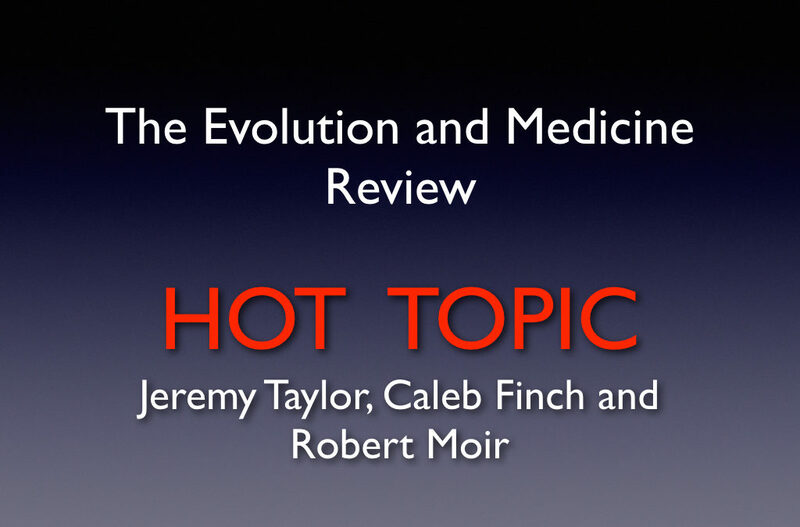 They welcome comments and suggestions sent to program@evolutionarymedicine.org. ISEMPH members get a considerable discount on registration fees, and a further 20% discount is offered to those who register for both ISEMPH and the ESEB meeting. For full details see the Society’s website. 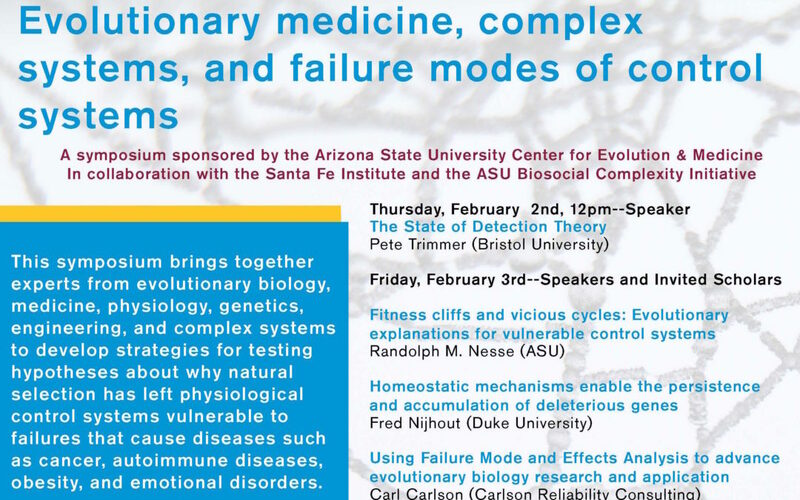 Sponsored by the Arizona State University Center for Evolution and Medicine In collaboration with the ASU Biosocial Complexity Initiative Live streaming link at the CEM Website on the symposium day This free symposium brings together experts from evolutionary biology, medicine, physiology, genetics, engineering, and complex systems to develop strategies for testing hypotheses about why natural selection has left physiological control systems vulnerable to failures that cause diseases such as cancer, autoimmune diseases, obesity, and emotional disorders. Four essays address the Hot Topic of Alzheimer’s Disease. Please contribute your comments at the end of each essay, or send your own essay to editor@evmedreview.com. Environmental Smoke in Alzheimer’s Disease Caleb Finch investigates a neglected factor that may influence the disease. The Aβ story: rehabilitation of a bad boy Robert Moir provides a fascinating new look at the antimicrobial properties of amyloid beta. Is Alzheimer’s disease related to heterochronic changes in the brain during human evolution? Enric Bufill offers a view of why neurons are vulnerable. On the 23rd November this year pharmaceutical giant Eli Lilly announced that the phase II early-intervention Alzheimer’s disease trial for a monoclonal antibody – solanezumab – designed to remove excess beta-amyloid protein from the brain, had failed. The news has caused another round of hand-wringing and head-scratching in the Alzheimer’s research community because it comes on the back of many trials, costing decades-worth of valuable time and billions of dollars, that has assumed the classical amyloid hypothesis will provide valuable targets for drug intervention. In the light of this recent failure Evmedreview presents a new HOT TOPIC feature of three consecutive posts commenting on this perplexing failure. The first, from Evmedreview associate editor Jeremy Taylor, discusses whether synapse loss is a better indicator of Alzheimer’s disease than amyloid and tau pathology and highlights the role of environmental factors and the immune system in AD etiology. The second, from Caleb Finch, makes the point that environmental factors have been far too overlooked in AD etiology and, in a typical example of blue sky (or should it be grey sky in this case) thinking, is the first article to highlight the role of smoke, smoking and atmospheric pollution. The third commentary, from Robert Moir, is based on his work over the last decade that shows beta-amyloid to be a potent brain-based antimicrobial with obvious repercussions for the caution with which we should approach clearing amyloid out of the brain, and for the possible role of microbial infection as the initial trigger for AD pathology. The following links demonstrate the extent to which successive drug trial failures have promoted rounds of navel gazing within the AD research community. The aim of this new Interest Group is to gather a network of SGIM members who share fascination with the view of health and illness through an evolutionary lens. Through this lens, the very nature of questions one can ask shifts from proximate “what” questions about mechanism and development in individuals to evolutionary “why” questions about selection forces and phylogenetic development. Medicine is based on biology and biology is based on evolution but medical education and research rarely taps into the elegance and power of evolutionary principles. Please email Mark Schwartz at mark.schwartz3@va.gov with your interest so we can hit the ground running at the Annual Meeting in Miami.. The Society of General Internal Medicine was founded in 1978 by a national group of academic general internists committed to promoting research and education aimed at improving health care for the whole patient. The organization has grown to nearly 3,000 members over three decades. Drawing upon their expertise and diverse experiences, our members are from the United States and eleven other countries, SGIM members have become leaders in the specialty of internal medicine. The Society is dedicated to insuring that all adults receive high quality health care in the 21st century. The broad expertise of our members in research, education, and clinical practice places SGIM and its members at the forefront of medicine.